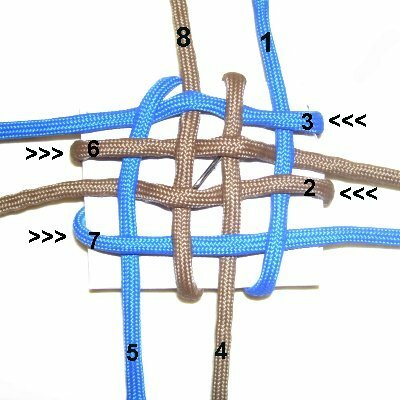 Description: The Celtic Weave is a combination knot that has been seen in Celtic artwork, but is not very well known. 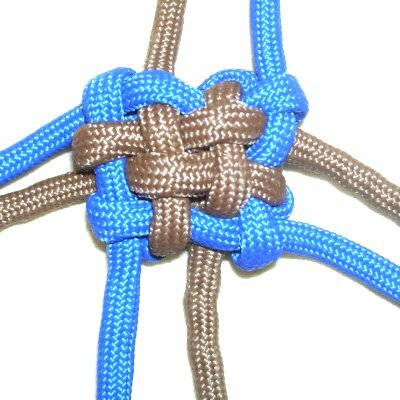 It features a Wall Knot, which is similar to a Lanyard Knot. The weaving in the center is surrounded by the loops created by the Wall Knot. 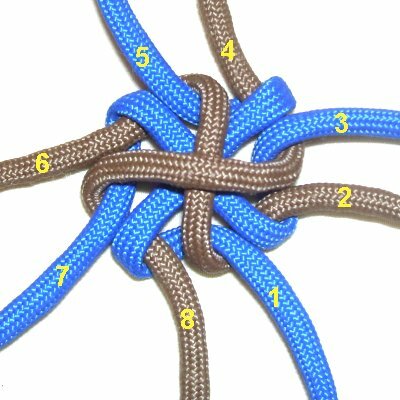 There are 8 ends that can be used for other knots, or they can be finished off. 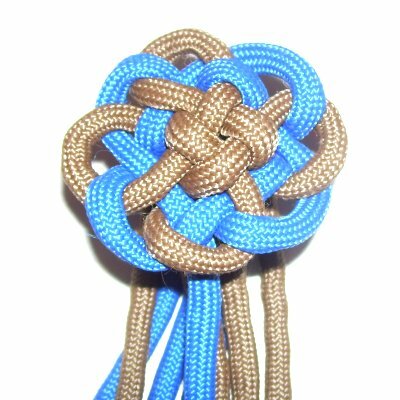 A decorative knot like this can be used as a focal point in many Macrame projects, including handcrafted jewelry. Knots like this can be used as a focal knot with cords coming out in different directions. In the images, two colors were used to show the details more clearly. The colors can be arranged any way you wish. 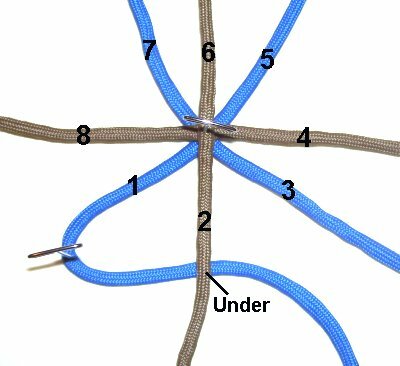 Paracord was the material used, which needs to have the tips melted with a flame to prepare the cords for knotting. Preparation: To practice, cut 4 cords, each at least 20 inches long. Place the first two on your board diagonally, forming a cross. The other two cords should be arranged so one is horizontal and the other vertical. This gives you 8 ends to make the base, which creates the loops along the outside of the Celtic Weave. In the instructions, they are described as if they were separate cords. 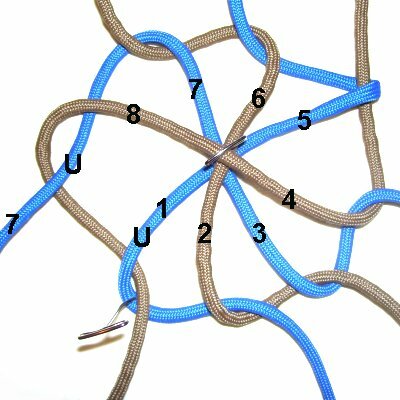 Mentally number each cord 1 thru 8, in a counter-clockwise direction, starting with the cord on the lower left. Step 1: Move cord 1 under cord 2, curving it towards the right. Secure cord 1 where it bends, so it is easy to recognize. Step 2: Move cord 2 under cords 1 and 3. This cord passes under the previous one moved (cord 1), as well as the cord ahead (cord 3). Step 3: Move cord 3 under cords 2 and 4. 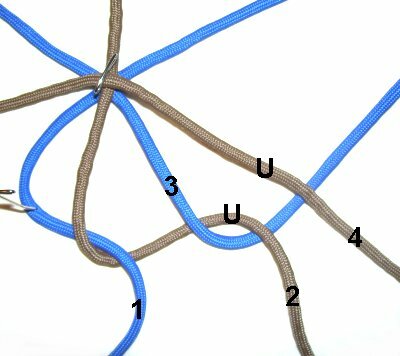 Continue on in this manner, until you reach cord 8. Be sure that each cord is moved under the previous cord as well as the one ahead. 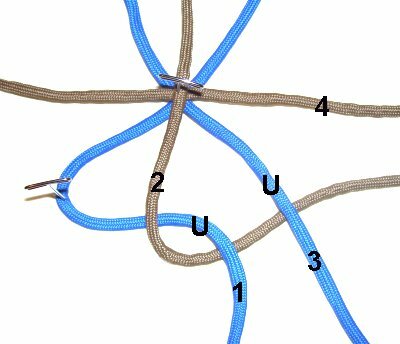 Step 4: Cord 8 should pass under cord 7 and then through the space formed by cord 1. Be sure to pass the cord into the curved area from below (under). Step 5: Tighten the base by pulling on the ends, one at a time (slowly). Don't tighten it all the way; leave some space for the final steps. 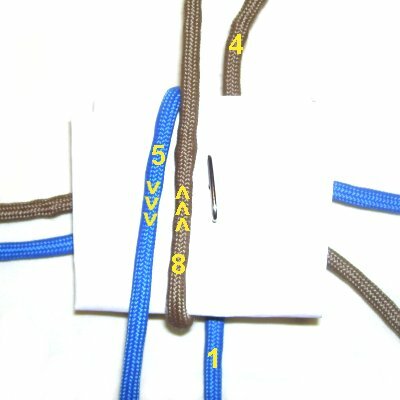 Two cords need to come out in 4 areas, mentally numbered as shown. Step 6: Place a piece of paper on top of the base, and secure it in the center. This way the weaving will be all you focus on when you create the upper part of the Celtic Weave. 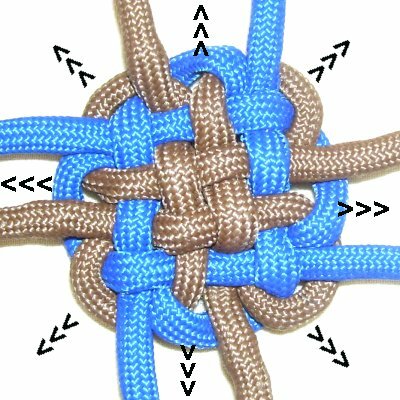 Each time you fold or weave a cord, secure it. This way you know which ones you have already moved. << Fold cord 5 over the paper, towards the bottom. Fold cord 8 towards the top. Step 7: The cords on the left and right areas of the Celtic Weave are used to create the horizontal weaving. Each cord passes through the vertical cords under - over - under - over. The pattern does not change whether they are moving left or right. 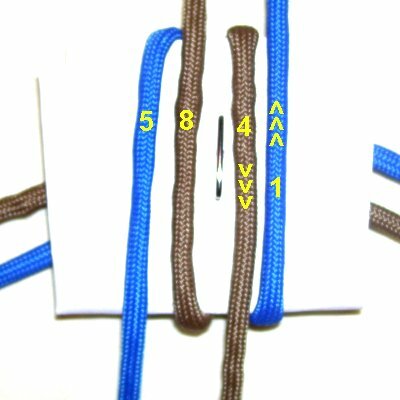 << Weave cord 3 right to left. Step 8: Tighten the weaving by pulling on all the ends, after removing the paper and pin. Try to keep the design square and as small as possible. Step 9: Pull each of the curved areas in the base outward, while holding the weaving firmly on your board. Pressing down on the center really helps. 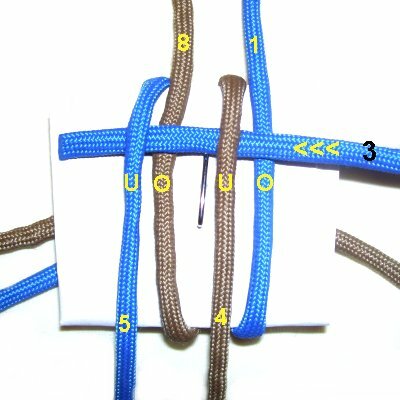 The loops should surround the weaving, forming a rounded square shape. The ends can now be used as attachment points for other cords. Another finishing option is to tuck each end through a loop which rests next to it. Make sure you pass it through a loop of the opposite color. This will bring all the ends to the back, where they can be finished off. Have any comments about the Celtic Weave? Contact Me.